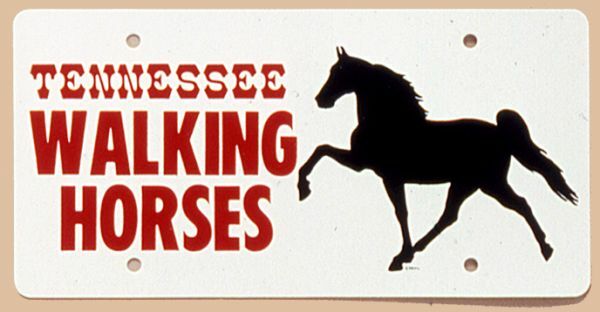 Order Horse Design license plates and frames online in a variety of styles. Equine-themed accessories for your truck or car feature running horses on pink or black. Hitch Cover snaps into place and fits all 2" hitch receivers. License Plate Cover says I ''Heart'' My Horse; snaps or screws onto any license plate. Durable plastic. Made in USA. Specify color: Pink or Black. Add the final touch to your truck or trailer with a license plate from our collection. Show pride in your horses breed with a colorful plate made of rust-proof aluminum. 6 x 12. 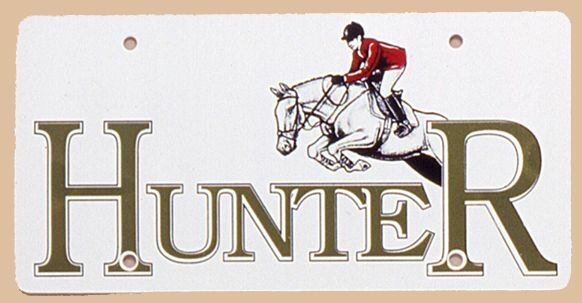 Hunter Jumpers Plastic License PlateSize:6X12"
Paint Horse Plastic License PlateSize:6X12"
Quarter Horses Plastic License PlateSize:6X12"
Tn Walk Horse Plastic License PlateSize:6X12"
Wild Horses Couldn't drive you away from this amazing Appaloosa Horse License Plate Frame. Gallop your way across the frontier every time you start the engine with this appealing License Frame. Appaloosa Horse License Plate Frames evoke the wild majesty of the old west with this spectacular spotted breed and every driver on the road will want to come along for the ride. 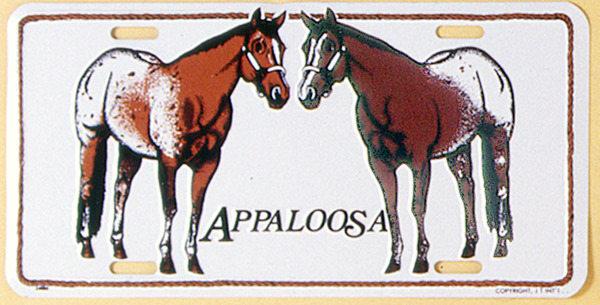 Made of shining chrome metal, the Appaloosa Horse License Plate Frame measures at 6 x 12 inches to fit any standard vehicle. Put the Horse back into your horsepower with this noble, stunning steed. If you travel with your animals, the Arabian Horse license plate is an absolute must-have for your auto. This glinting chrome license frame lets people know what you're all about. An Arabian license plate frame is a great way to let the world know that you take pride in both your ride, and your pet. 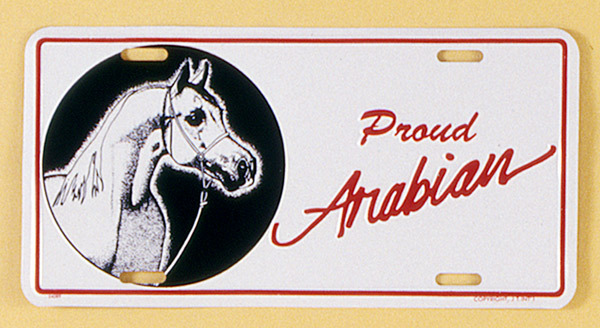 Arabian Horse license plate frames will invite comment from people about your favorite breed. Go ahead and take that opportunity to brag about your horse. They measure 6 x 12 inches and fit most US vehicles. This Horse License Plate Frame lets you keep your equines on center stage while you travel. We know they can't go everywhere you do, but this is a way to bring your steeds and mares along with you in spirit. The Horse License Plate Frame is well crafted out of chrome metal and fits most trucks and cars in the USA. These Horse License Plate Frames would make a nifty present for the equine fanciers in your life that pretty much have everything. This License Frame is truly top of the line, just like the equine! 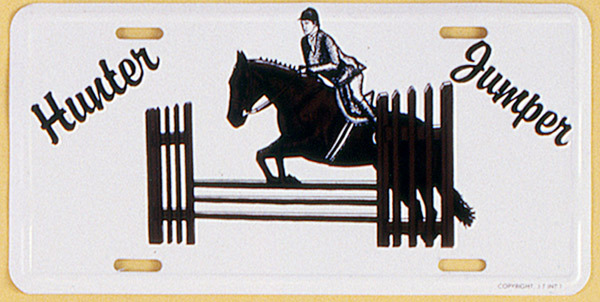 Wild horses won't be able to distract you from this fabulous Morgan Horse License Plate Frame. If you want to add a little of your own personality to your vehicle or trailer, this Morgan License Plate Frame is the perfect solution. Make a statement without saying a thing as you drive down the freeway or country road. Drivers behind you and beside you will be craning their necks to read your License Frame. Our chrome Morgan Horse License Plate Frames measure 6 x 12 inches in size and will fit most any vehicle. Run wild with your new Paint Horse License Plate Frame attached to your vehicle. Show your appreciation for this spotted breed with our Paint Horse License Plate Frame. You will be the center of attention at the next convention, bringing smiles to onlookers from all directions. 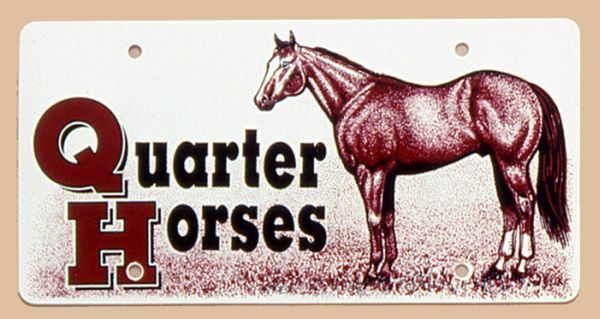 Our Paint Horse License Plate Frames made of chrome metal and measuring approximately 6x12 inches, are backed by our unconditional guarantee. Get your Paint Horse License Frame today and make a meaningful statement about your favorite breed. 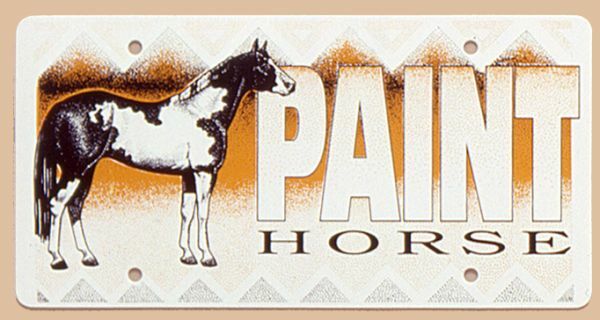 Show off your car's horse power with this Palomino Horse License Plate Frame. Your truck or trailer will stand out on the road or at the horse show when you deck it out with this license frame. Made of chrome metal and measuring 6 x 12 inches in size, this Palomino License Plate Frame is a great way to customize your vehicle without spending a trailer full of money. Our Palomino Horse License Plate Frames make an excellent gift for equestrians. Our Shetland Pony license plate frame will make you the king or queen of the road. When others see you riding in style with the Shetland Pony license plate frame, they will be envious of your good taste and you can expect tons of appreciative honks. Each Shetland Pony license frame is made from sturdy chrome metal and measures approximately 6 x 12 inches. Any equestrian fancier would appreciate the charm and sturdiness of this amazing Shetland Pony license plate frame, so get yours today or treat someone special to this great item. Simply put, our thoroughbred license plate frame is the only way to go for horse lovers. Just put it on your car, and our all-chrome thoroughbred license plate frame tells everyone around that the driver is wild about the Thoroughbred Horse breed. It's a great way to get noticed in the crowd. 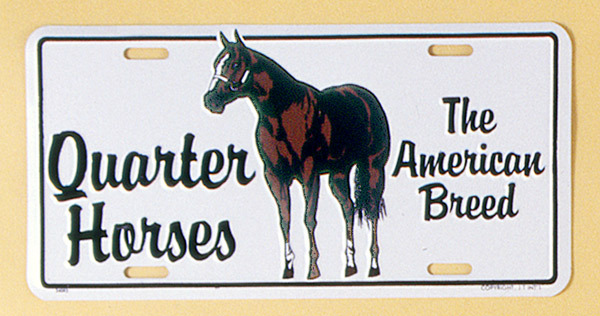 Our Thoroughbred Horse license plate frames fit most cars and trucks and install with just a simple setup. Their sturdy chrome construction means they last and last. Each Thoroughbred Horse license frame measures 6 x 12 inches.